Pittsburgh Shooting And Other Cases Point To Rise In Domestic Extremism The U.S. endured three bouts of domestic extremism last week. American-born men with far-right beliefs have been charged in all of them, in keeping with a long-standing pattern. 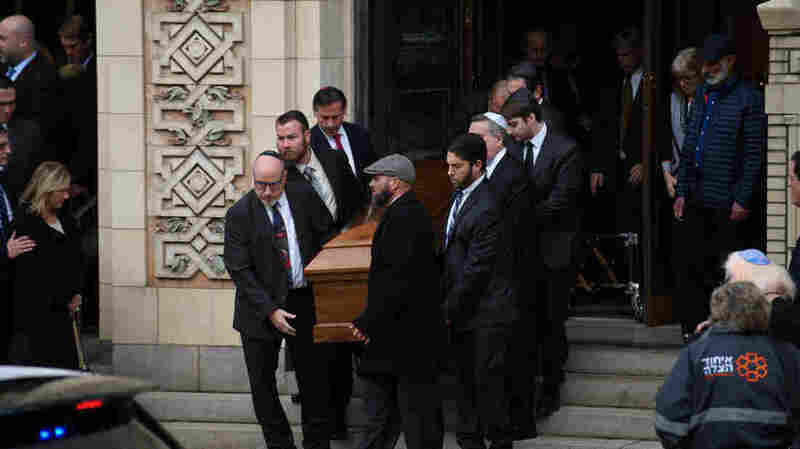 Pallbearers carry the caskets of brothers Cecil Rosenthal, 59, and David Rosenthal, 54, on Tuesday in Pittsburgh, Pa. The brothers were among 11 killed in the mass shooting at the Tree of Life Synagogue last Saturday. The 2001 attacks by al-Qaida led to a national-security focus on Islamist terrorism originating abroad, but those attacks have always been the exception. Over the past 17 years, deadly attacks in the U.S. by the far right have outnumbered those by radicalized Muslims 70 to 26, a ratio of nearly 3-to-1. The figures come from the U.S. government and private groups that track terrorism. The total death toll from both types of attacks is roughly the same, with the far-right and Islamists both accounting for around 125 deaths during this period. The far-right tends to target minorities, while Muslim extremists tend to go after the public at large, notes Bill Braniff, director of the START consortium at the University of Maryland, which tracks terrorism. Attacks by the far-right and white supremacist groups began increasing about a decade ago, and have become even more common in the past three years or so, according to Braniff. He said research into the phenomenon points to an often expressed far-right obsession that white Americans are at risk. "What are the characteristics of an individual that allows them to go from non-violence in support of one of these ideologies, to violence? We find that believing in this collective sense of victimhood is a near necessary condition," Braniff says. Robert Bowers, the man accused of shooting to death 11 Jews in a Pittsburgh synagogue, posted anti-Semitic remarks on his social media accounts. Gregory Bush, the Louisville suspect charged with the shooting deaths of two African-Americans in their 60s, had a reputation for racist comments. And the mail bomb suspect in Florida, Cesar Sayoc, told co-workers that he admired Hitler and thought gays, Jews and blacks should be "eliminated." Testifying to the Senate Committee on Homeland Security on Oct. 10, FBI director Christopher Wray said the bureau considers the greatest threat to the U.S. homeland to be Islamist extremists radicalized here in the U.S. But he noted that the FBI has about "1,000 active investigations into domestic terrorism ... the full range of extremist ideologies from right to left, and everything in between." He didn't break it down, but made clear this number did not include suspected Islamist extremists in the U.S.
Attackers often leave plenty of clues in their social media accounts foreshadowing what is to come. Sayoc, for example, had active yet mundane accounts for years, where he talked about bodybuilding, sports and night life. His focus shifted dramatically in 2016 as he became an ardent backer of President Trump and a harsh critic of prominent Democrats, sometimes making veiled threats. However, thousands of American men express similar views and those who study social media say it's impossible to predict who will act, and who's just ranting. President Barack Obama's administration created a program, Countering Violent Extremism, which gave grants to local groups to try to prevent different types of radicalization. The program was small and results hard to measure. How do you know how many people weren't radicalized? The Trump administration has scaled the program way back and placed little emphasis on far-right threats, despite their growing numbers.